Life is fundamentally a non-equilibrium phenomenon. At the expense of dissipated energy, living things perform irreversible processes that allow them to propagate and reproduce. Within cells, evolution has designed nanoscale machines to do meaningful work with energy harnessed from a continuous flux of heat and particles. As dictated by the Second Law and its fluctuation theorem corollaries, irreversibility in non-equilibrium processes can be quantified in terms of how much entropy such dynamics produce. In this work, we seek to address a fundamental question linking biology and non-equilibrium physics: can the evolved dissipative pathways that facilitate biomolecular function be identified by their extent of entropy production in general relaxation processes? We here synthesize massive molecular dynamics simulations, Markov state models (MSMs), and non-equilibrium statistical mechanical theory to probe dissipation in two key classes of signaling proteins: kinases and GPCRs. 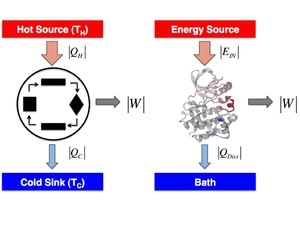 Applying machinery from large deviation theory, we use MSMs constructed from protein simulations to generate dynamics conforming to positive levels of entropy production. We note the emergence of an array of peaks in the dynamical response (transient analogues of phase transitions) that draw the proteins between distinct levels of dissipation, and we see that the binding of ATP and agonist molecules modifies the observed dissipative landscapes. Overall, we find that dissipation is tightly coupled to activation in these signaling systems: dominant entropy-producing trajectories become localized near important barriers along known biological activation pathways. We go on to classify an array of equilibrium and non-equilibrium molecular switches that harmonize to promote functional dynamics.